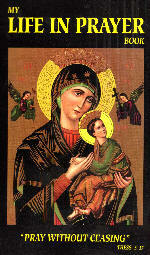 O Mother of Perpetual Help! grant that I may ever invoke thy most powerful name, which is the safeguard of the living and the salvation of the dying. O purest Mary, O sweetest Mary, let thy name be henceforth the breath of my life. Do not hesitate, O Blessed Lady, to help me whenever I call on thee, to assist me; for in every temptation which will assail me, in all the necessities which may afflict me, 1 will never cease to call on thee by often repeating: O Mary! O Mary! O what consolation, what sweetness and confidence, and what emotion does not my soul experience when I utter thy name, or only think of thee! I thank Almighty God for having given thee, on my account, so sweet, so powerful, so lovely a name. But I will not be content with the mere invocation of thy name. I will call on thee, burning with love for thee, and beg that my love for thee may prompt me constantly to salute thee: O Mother of Perpetual Help!